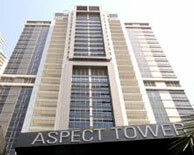 The Aspect Tower is a freehold boutique office tower at the Business Bay. The freehold office tower is being launched to meet the demand for freehold office spaces in Dubai. It is located on Sheikh Zayed Road before the second Interchange at the northwest side of the Executive Tower. It is exactly located between Defence Roundabout and Safa Park and will be easily accessible from Sheikh Zayed Road. The Aspect Tower have 166 offices of different sizes varying from 1,000 square feet to 3,000 square feet. The top floor offices, area larger then the other offices and have the areas of up to 6,000 square feet. The tower is basement, ground, mezzanine and 39 floors. It has a covered car parking facilities with the capacity of about 740 cars.The tower has eight passenger elevators and one service lift. High end telecom services is provided by Dubai Internet City.